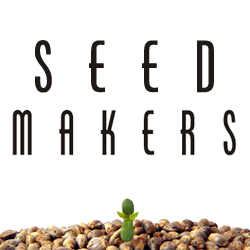 Seedmakers picks seeds from expert and independent breeders. Many of them with years of work experience in other seed banks. Selecting, crossing and setting various varieties are only a few things that Seedmakers take care of. Their high quality seeds, which are all feminized, getting the best prices of the market. They are the result of the most careful selection of parental, to cross them between the best specimens. Varieties Seedmakers offer are the result of the breeders interest in to improve varieties, result of the effort for brushing up that what is really special.